Puran Poli is a popular sweet dish made during Holi festival. It is like a stuffed paratha filled with dal, jaggery and coconut. This is also made during Diwali and is often served as a dessert or as an evening tiffen. Knead well to make a stiff dough. Cover the dough and keep aside for 2 hours. Pressure cook the dal and strain out the water. Once the dal has cooled, add sugar along with 1 tblsp of ghee. Cook on low flame till the gram mixture is soft and sticky. Knead the dough again, adding salt, water and oil, little at a time, till the dough becomes pliable. Grind the dal and sugar mixture to a smooth consistency adding a little milk if it is too dry. Take a lime-sized lump of the dough and a little larger lump of the dal mixture. Roll out two rounds from the dough on a board sprinkled with rice flour, into flat rounds of about 7 inch in diameter. Cover on round with the dal mixture, leaving half an inch at the edges, and then cover this with the second round. Roll again over this to seal them together, pinching the edges to seal well. Roll out like a thick chapathi. Heat ghee on a hot griddle and put the puran poli on it. Keep pressing and turning it so that it cooks well on both sides. Keep adding ghee all around to brown it evenly without sticking to the griddle. 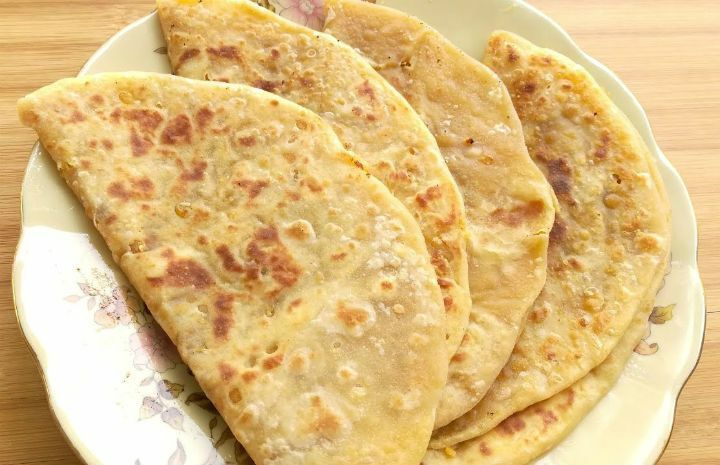 Feel free to comment or share your thoughts on this Puran Poli Recipe from Awesome Cuisine.